5 Things I Have Learned in a Month Blogging. Oh my goodness, I can’t believe it has been almost a month since I have gone live. It seems longer to be honest. I have come a long way since day one. 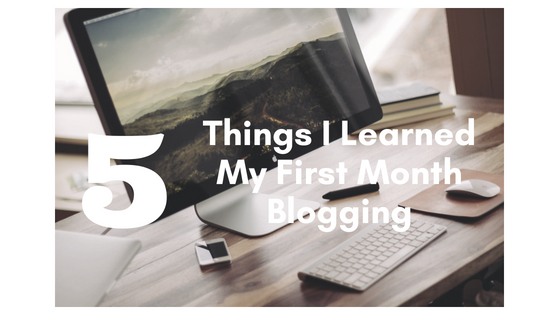 I have listed 5 things I have learned in a month blogging. I am hoping I can help push someone along in their blogging experience. I first started with a free wordpress.com site, which was okay because I was only journaling my activities. I still have drafts that I need to go through and turn in to how-tos. When I decided to turn my journaling into how-tos, I paid to upgrade my wordpress.com site so I could drop the WordPress from my domain name. I did okay, but after reading what everyone else had, I felt a little left out. WordPress.org had so much more. WordPress.com is shared hosting, so you don’t own your website. You are limited to what affiliate links you can use, and unless you buy the most expensive package, you can’t have plugins. I’m not saying you shouldn’t use wordpress.com. It was easy to set up, and their customer service was helpful. WordPress.org is self-hosted, you own your website. You have access to plugins which opens up a ton of options, and you can advertise your affiliates how you want. Yoast SEO, why, because the point is for people to find your site. WP Smush, this helps your website function better and helps with SEO. Wordfence Security, to help with security. Tracking Code Manager, because to claim sites; like Google or Pinterest you have to post to the head of your website. What is the head of a website? I have no clue. I don’t have to know because I have this plugin. Really Simple SSL, because your site needs to be secure. Google Fonts, because I want a pretty heading. Contact Form 7, because I want you to be able to contact me. 3. How do you get all of this? You set up through a host. I researched several hosts and their reviews. In the end, I went with Site-Ground. They helped me transfer my domain and was very helpful every step of the way. My site was fully functional through the transfer. 4. How do I utilize social media? Social media will play a big roll in getting your blog out there. I set up a facebook page, Instagram page, and a Pinterest page just for my blog. I would recommend using separate pages from your personal pages. Joining groups on Facebook helped me learn a lot about blogging. I highly suggest this. I have a DIY blog, so Pinterest should be my priority, but I’m still learning anything outside of pinning a post. There are all kinds of social media I haven’t heard of. I am now on Mix, Google+, Bloglovin and more. I don’t have a following or completely understand it. Any help on this will be appreciated. Search Engine Optimization is a list of things you must do to make sure you can be found easily on search engines. Use keywords in your headlines and your slug. Make sure these keywords are in your first paragraph. Make sure you have a Meta-Data. Overwhelming? Yeah, just a little. I’m sure there is more, but this is what I’ve been working on at the moment. I am slowly going through my SEO checklist for each post. 4. What are Affiliate links? Affiliate links are advertisements. You can make a commission if someone travels through that link and makes a purchase. Using affiliate links can monetize your blog without costing the customer extra. A big one is Amazon, everyone shops Amazon. I mean why wouldn’t you? It’s practically an online mall of people trying to win over your sale. If you have prime, which I think is must, you can get anything you buy in two days, right at your doorstep. I also go through Share A Sale; they are an Affiliate Marketing Network. Through Share a Sale, I use Dollar Tree, Craftsy, Checks Unlimited, Cricut, Annie’s, Lion Brand Yarn, 4 Checks and many others. Grammarly, not only do I use this website for my blog they also have affiliates. I just got approved through Google Adsense I’m excited to use this because I hear this is a good way to monetize your site. 5. How do I get answers? There is a huge online community of people willing to help you. There are blogs and other websites full of information. SiteGround or WordPress respond quickly to answers. Facebook groups with other bloggers are very helpful and are willing to answer questions, just ask. I have created a few printables; a daily blog checklist PDF and a username and password page that I think will be helpful in my daily blogging activities and maybe yours too. You can find these at my Etsy Shop. I just started this shop, so it looks like a ghost town but I hope to fill it with nice things. Super great info for everyone working on starting and building their blog! I’ve been blogging a while just for fun, but I’m looking to monetize soon! This post is so helpful to new bloggers. It’s simple and easy to understand. LOve that you broke down the finer details. Great tips! I’ve learned much the same stuff… still learning I guess 🙂 Hope I always will be!! Very informative post! Getting started blogging and learning about all the ways to monetize and get your blog set up can be so overwhelming! So it helps to have a nice breakdown like this. Thank you! So informative and basically answered all the questions I had when I started my blog last Fall! This is a great list! I think it’s hard being a newbie blogger because you have so much to offer but don’t know exactly where to start! It is great to have resources to help. These were some big questions I had, I just hope to learn more. Thank you. My blog through site ground is fairly new too. You gave me some great tips of stuff I had completely forgotten about setting up! This info is so valuable to people who are trying to get their blog going! The first month of blogging is so exciting. It can also be intimidating but it’s great when you reflect and realize how much you have learned. Amazing information for those of us who are just starting out! Thanks for being so thorough. how informative is this! im not an IT person so this are really useful tips to me! thank you for sharing! Saving this article so I can go through your list of plugins again! Thank you for breaking everything down. You really have to do some research to figure this stuff out. I thought I was pretty tech savvy till I tried to start a blog. Thanks for breaking it down.